While this year’s Super Bowl excitement was, as usual, greatly hyped before the kickoff, the actual game lacked let’s just say… good football. This gave plenty of focus to a second tradition that is equally expected on Super Bowl Sunday: the commercials. This year’s commercials were just as humorous, moving, and exciting as always, but it was obvious that brands were trying to tap into a third element of television and football. Social media was a buzz as the Broncos struggled in the 1st, 2nd, 3rd, and 4th quarters, but also in between downs and time outs as nearly every single brand’s commercials highlighted a distinguishing hashtag at the end of their commercials. MarketingLand.com quickly produced an in depth report on the topic. They reported a hashtag was present in 57% of national commercials while typical symbols for Facebook and Twitter were present in 9% and 7% of ads, respectively. URLs of the brand’s website were also present in 41% of commercials. While this influx of hashtag and social media usage was expected, this brand encouragement to engage with their commercials and campaigns is something every internet marketer wants to see. However, the question is, does it help? In the end, does this help Jaguar sell more cars, Budweiser more beer, and GoDaddy more domain names? 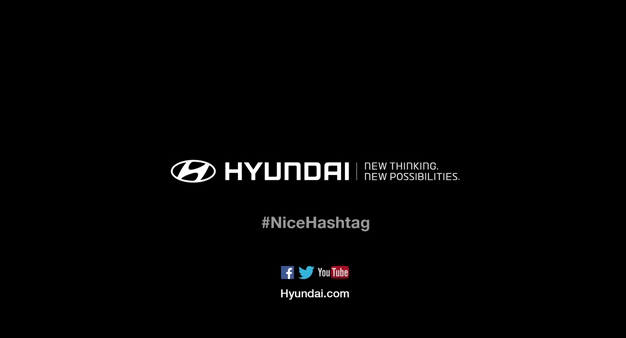 Hyundai’s hashtag was one of my personal favorites. #NiceHashtag. Their campaign was focused on the “Nice” car idea, but I can’t help but think that they might just be poking some fun at every single commercial out there. This is where I began to wonder if these hashtag campaigns actually do anything. All data represented is from the morning after the Super Bowl for emphasis on the immediate brand interactions associated with each commercial. Some brands’ hashtag campaigns really fit into the commercial. For instance, one of the best from the above was Jaguar’s #GoodToBeBad both with high Youtube views and Twitter counts. The commercial was a success for Jaguar in that aspect and the hashtag seemed to go viral. However, there are some major differences between this commercial and the rest. For one, the commercial was just great. It is one of the most defining car commercials in the Super Bowl. 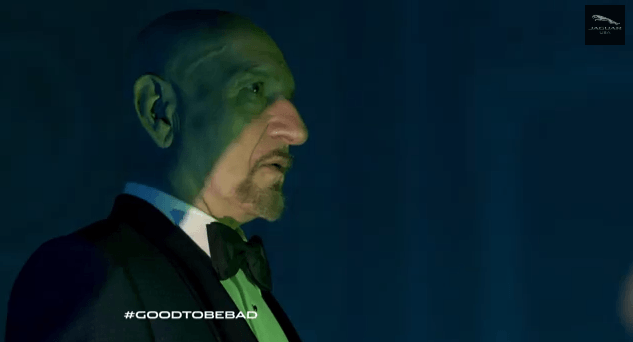 But, it also had the #GoodToBeBad hashtag clearly visible for about 4 seconds at the most interesting point of the commercial rather than the typical closing brand information screen blip. Ford’s #nearlyDouble also did well, but that’s what happens when you say those exact words about 100 times throughout their 60 second spot. Other brands here played it safe and either didn’t offer a hashtag at all or just simply displayed a branded hashtag. These also seemed to do well just like #VW. The ideal trend wanted here is the combination of a good commercial with a memorable hashtag. Many commercials did great, but the interaction with the commercial on Twitter was severely lacking. Volkswagen recognized this and thought it might be better to just leave out the weird hashtags and keep the brand name in there. Toyota and Kia didn’t even display a hashtag. They most likely put a lot of thought into that and determined it was best to just keep the interactions between the brand name and the commercial rather than create some buzz around a random mention of the Muppets or the matrix. Brand engagement might be the ultimate goal for these companies. But whether or not it will lead to more car sales this year, we may never know. Even Maserati had a commercial this year which strikes me as odd since the general perception of Maserati cars is of a super luxurious sports car that most Super Bowl viewers won’t be able to afford. Most individuals who would seriously consider buying a car like that after seeing a Super Bowl commercial are most likely already at the game, I assume. However, many other companies represented between hikes on Sunday are certain to see a spike in sales due to their user engagement between the commercials and Twitter. Here are some of the best uses of Hashtags and Brands that were on display. T-Mobile was able to really capitalize on the ability to get Tim Tebow in on the “no contract” joke. While this might have been quite an announcement for those ready to switch carriers, I’m not sure who ended up doing better: T-Mobile, or Tim Tebow. Needless to say, they created a great combination of a string of commercials that lead to a simple informative commercial without Tebow’s influence. Bruce Willis drawing you in face to face really got the attention of a crowded room. 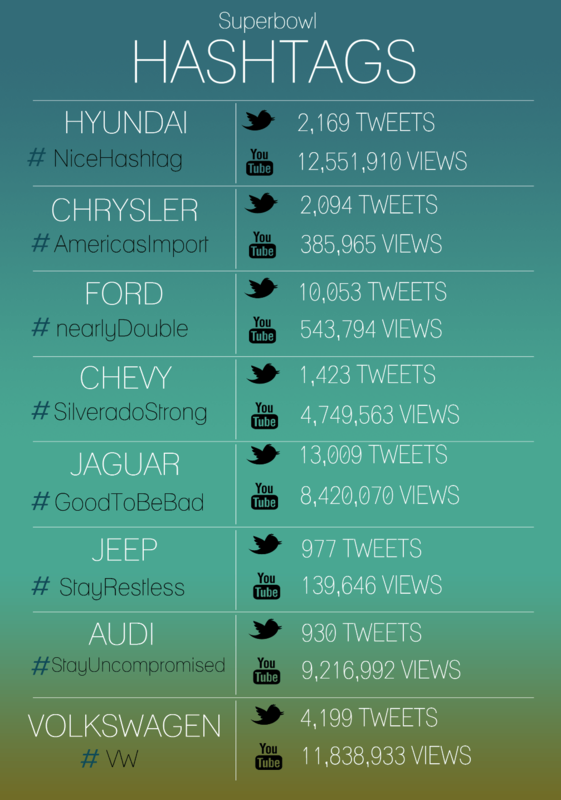 The combination of his dialogue and Honda’s new safety feature strategy campaign did fairly well on Twitter. However, the very non branded hashtag may not have been the best idea for Honda as the Honda handle itself received very little attention. Budweiser, as usual, blew everyone away with their heartstring tugging, emotional, and not very beer related commercials. Their Best Buds video is topping the charts with nearly 40 million views on the morning after the Super Bowl. The salute to American soldiers too was very compelling and triggered a lot of social media attention. Budweiser has discovered the things that matter to us most and done their best to reach out in those ways. It is also important to note that #salute receives about 10,000 tweets on a regular basis. Without extensive marketing campaigns, a hashtag’s life may not last very long. By penetrating a hashtag already used on a daily basis like #salute, they most likely are able to extend the use of that hashtag and therefore the reach of their brand even further. Other brands even got involved in the funny business. But if you look closely, this was actually deeper than the promotion of just a pair of mittens. No one even got the joke until later when they revealed the fact that they were tweeting with them on. And this only spurred on even more interaction. Take a look at the stats on this one! 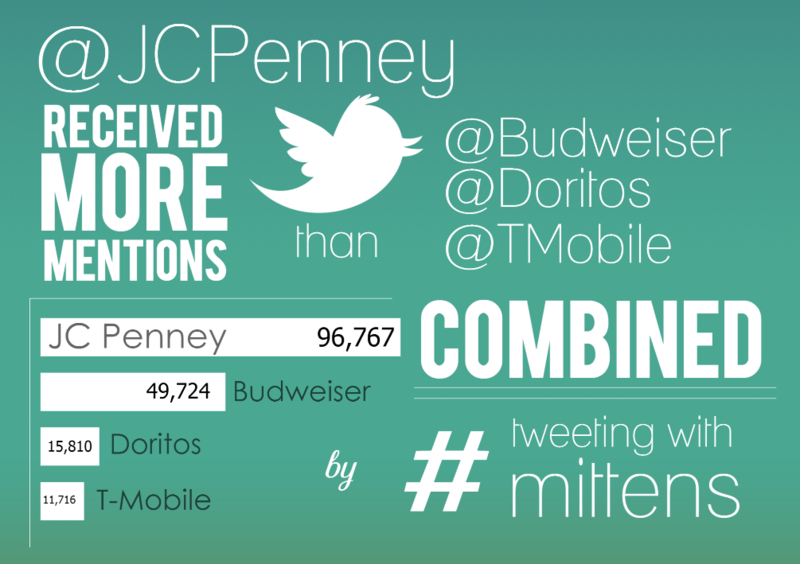 Compared to other brands that were blasting several commercials during the game, JCPenney received more attention than T-Mobile, Doritos and Budweiser combined! The buzz of viewers discussing what the heck was happening combined with additional brands getting involved created quite the brand awareness for JCPenney. While it initially may not have been good awareness, the joke was on everyone else when the mittens came off. The effectiveness of this campaign took off due to the creativity of those behind this one. They didn’t need a commercial. JCPenney doubled Budweiser’s brand awareness just by coming up with a good idea. The point of the hashtag in all of these commercials can easily be trumped just by being in the right place at the right time. In this case, the right place and the right time isn’t necessarily a 60 second spot right after a timeout. The right place? Twitter, a free social media platform. The right time? During an event when lots of users are active online—the Super Bowl. This extreme exposure didn’t even cost them the millions it takes to be seen for 30 seconds as traditional commercials do. Budweiser – for creating once again the most compelling commercials out there that not only target traditional marketing channels, but also cross into social media platforms in various ways. JCPenney – for showing a unique sense of humor and extreme creativity to blast your brand recognition beyond those who paid much more than you. Youtube – who will be generating millions of dollars in ad revenue from streaming millions of views of Super Bowl commercials. A lot of these strategies that were developed for Super Bowl Sunday are distinctive to big corporations. However, there are areas we can take away from that will apply to any marketer out there. Honda’s Hugfest, T-Mobile’s #nocontract, and Audi’s weird dogs were all great commercials. But in the grand scheme of things, the message wasn’t always very clear, which translated into poor branding. They focused on the idea of the commercial rather than the feature of the brand. I will argue that T-Mobile’s use of Tim Tebow was perfect for promoting the idea. However, as shown above, Tim Tebow himself received most of the attention. This isn’t always easy to do, but a good form of marketing is always relevant to your brand. If you can’t put your name at the beginning, middle, and end of the entire commercial, campaign, or piece of content, then it might be time to rethink your strategy. Some brands realized this and decided it was better to leave out the hashtag, but instead focus on the brand name itself. Now that you have a relevant strategy for your brand to get your name out there, you need to find the perfect places to flash that hashtag or URL. Jaguar did just that. The music builds up, pulls you in, the action pauses, everyone is focused on the screen – and there is the hashtag. Not only was it on the screen, but it was verbally announced by the actor himself at that same moment. This was the moment when everyone began pulling out their iPhones to tweet about the commercial, and that was the goal. In internet marketing terms, this would be defined as a call to action. It was clear what you were supposed to do upon seeing that part of the commercial. Make your content just as suspenseful, placing your calls to action at crucial moments where viewers will absolutely have to do exactly what you want them to, just like Jaguar. You could have the most expensive commercial, biggest agency, and the largest marketing budget, but your campaign might be easily trumped despite your efforts. Doritos most likely recognized this by allowing fans to submit their own commercials. They are looking for the greatest creativity out there, and if they find it, great. JCPenney didn’t even need a commercial to get the same social media buzz that #BestBuds received after what was most likely millions of dollars of both production costs and the bill to air the commercial. Think out of the box. Put a twist on the usual or do something that hasn’t been done before.